EDITOR’S NOTE: This essay has been adapted from chapters 1 and 22 of Tim Weiner’s new book, One Man Against the World: The Tragedy of Richard Nixon, with the kind permission of Henry Holt and Company. But Richard Nixon was never at peace. A darker spirit animated him — malevolent and violent, driven by anger and an insatiable appetite for revenge. At his worst he stood on the brink of madness. He thought the world was against him. He saw enemies everywhere. His greatness became an arrogant grandeur. Watergate burglary overseer Howard Hunt was set to appear Monday afternoon before the Watergate grand jury; he had blackmailed the White House by threatening to reveal “seamy stories,” and he knew several. Up next was deputy director of the Committee for the Re-Election of the President Jeb Stuart Magruder, whose will to continue committing perjury was weakening. If Magruder testified truthfully, he could incriminate John Mitchell — the “Big Enchilada,” as adviser John Ehrlichman called him, the nation’s chief law enforcement officer from 1969 to 1972, and of late the president’s raiser of hush money. 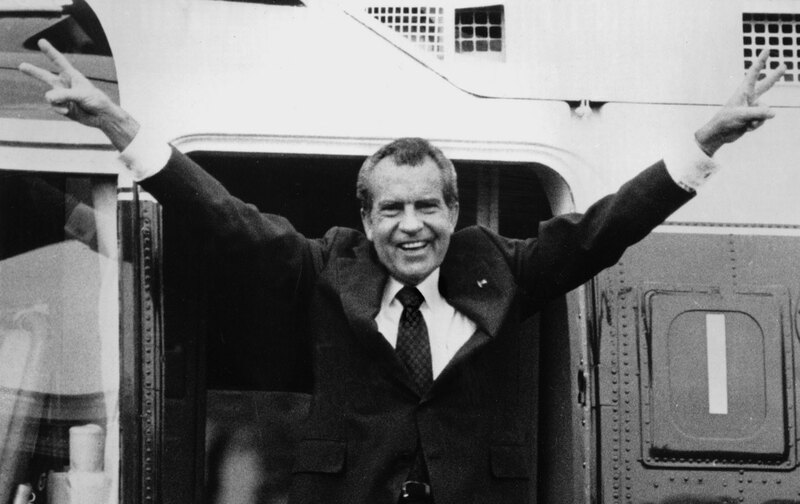 And if Mitchell were indicted, “that’s the ball game,” Nixon said. Magruder had just pointed a dagger close to the heart of the White House. “I’m going to plead guilty” and testify for the prosecution, he told Haldeman, who taped their telephone conversation. Magruder had implicated John Mitchell that day in an informal conversation with federal investigators. “I am in a terrible position because I committed perjury so many times” in the Watergate case and the cover-up. He couldn’t take it anymore, he said, and he had to seek absolution. Nixon, Haldeman, and Ehrlichman had arrived at a moment of truth — or falsehood. The Watergate break-in was one problem. The greater danger was the cover-up and the peril it posed to the president if it began coming apart. Then Nixon said — as if unconscious of his rolling tapes — “Well, I knew.” He was acutely aware that he was doomed if Dean testified about the cancer on his presidency and the million-dollar cure. Ehrlichman: The first one I talked to was your predecessor. Then I talked to Magruder… He has decided to come clean. The mercurial Al Haig, promoted from colonel to four-star general by Nixon, was the new Haldeman and Ehrlichman — the president’s chief of staff and palace guard. He was the only man Nixon could depend upon in his time of crisis. The Senate Watergate Hearings were set to begin in 17 days — and the president had no counsel, no one in official command at the FBI or the Justice Department, and only Haig to trust. Then another general — Vernon Walters, the president’s handpicked deputy director of central intelligence, a man of impeccable discretion who had worked with Nixon since 1958 — delivered a set of documents to Haig. Copies would soon be in the hands of senators and Watergate investigators. That same day’s newspapers reported that the federal judge presiding over the espionage trial of Daniel Ellsberg in the Pentagon Papers case had dismissed the charges on grounds of government misconduct. Belatedly, the Justice Department, as required under law, had disclosed the misconduct — a warrantless White House wiretap recording Ellsberg, and the Plumbers’ break-in at Ellsberg’s psychiatrist’s office. He confessed that the taps were part of “a dangerous game we were playing.” He also told them where transcripts of the wiretaps might be found: in the White House safe of John Ehrlichman. The acting FBI director William Ruckelshaus recalled: “An FBI agent, sent by me to the White House to guard those records and others in Ehrlichman’s office, was badly shaken when the president of the United States seized his lapels and asked him what he was doing there.” He was upholding the law of the land — and helping to make a case against the president of the United States. How they were going to stonewall the Huston Plan was another question. Nixon had endorsed every kind of government spying on Americans — opening their mail, bugging their phones, breaking into their homes and offices — until J. Edgar Hoover himself killed the program. John Dean had placed a copy of the incendiary plan in a safe-deposit box and given the key to Judge Sirica. He intended to turn the copy over to the Senate Watergate Committee. “– We’ll destroy ourselves,” the president said. Excerpted and adapted from One Man Against the World, The Tragedy of Richard Nixon by Tim Weiner, published by Henry Holt and Company, LLC.